Popular in hot summer climates they thrive in the most torrid environments- in fact they require a certain amount of hours above 85ºF to cease growing and commence flowering. Luckily our climate there is adequate heat for many cultivars to thrive and bloom. The amount of heat that each cultivar requires is distinct. And those that we have chosen will bloom annually with correct siting and cultural care in an average warm summer. This means you can get a tree to flush into bloom in July and remain blooming for at least 2 months. Nearly all cultivars will re-bloom once the main flowering has commenced. Few trees can match that. Crape myrtles adore full all day sun and will not deal with shade in any capacity. Full all day sun in a hot position and consistent summer water ensures excellent performance. We cherish Crape Myrtles for their ability to bloom for the last half of summer. Few trees bloom then and the vivid colors are both spectacular and long lasting. When a cultivar has received adequate heat it will stop growing and commence blooming. This can happen very quickly- often after a heatwave in combination with regular irrigation flowers and growth will happen in just a week or less. Crape myrtles are drought adapted but this will be at the expense of growth and bloom. The best way to determine if they are adequately hydrated is that the leaves will be glossy, shiny, and lustrous and growth will be robust. Drought stressed trees will have dull, mat leaves, a sign of their thirst long before you see evidence of wilting and will stall- little growth and leaves can take on red/purple tints of stress. To re-hydrate a drought stressed tree simply put the end of the hose near the base of the trunk and turn the water on very lightly and soak for 3-4 hours. To be efficient create a basin around the base of the tree and fill it repeatedly. This will direct water directly down to the roots. Done in the heat of summer this can wake the tree in just a week or two. And flowers are sure to appear. Consistency above all else makes them happy. Put them on a regular- deep but infrequent watering regime and you will be amazed at the results. Drought stressed trees will often not bloom or bloom very late- Sept- October. The older and more established the tree the earlier, more profuse and less water it will require. Pay close attention to this in the individual descriptions. If a cultivar requires regular irrigation to perform- it really does. Water your Crape myrtle deeply once every two weeks as our summer drought takes hold in June. They are best adapted to heavy clay soils which retains the fertility and water that their probing ropey thick roots require. These roots are very efficient at extracting nutrients and in fact it is best to avoid over enriched soils- too much compost or manure- will lead to rank growth that does not “harden” in time for winter cold leaving them susceptible to an early or intense freeze- average soil is ideal. They are fantastic in the center of irrigated lawns or flower beds- but avoid boggy conditions. They are very easy trees to grow. Their size and scale as well as small round leaves make them a natural companion with other diminutive garden trees- pair them happily with Japanese maples, Cotinus (Smoke Trees) any smaller scale tree. Fall color is often brilliant and can be brief but matches the most most vivid hues of any tree. The small leaves once detached decompose very quickly, often gone or blown away by the time the gardener has time to reach for the rake. There really is no completely incorrect way to prune crape myrtles. They bloom on wood from the current season so errant clipping will not eliminate flowers. For tired and neglected trees you may prune back the strongest leaders by 1′-3′ but no more. Pruning stimulates these trees to grow vigorously and bloom. Avoid stumping them back to big trunks. This harmful method of pruning is called “Crape Murder. Unfortunately, It results in mis-shapen scarred trunks and rank weak growth which is unable to hold the huge heavy flower trusses. They droop and can snap and makes rare summer rain destructive. It also destroys the natural grace and character of each cultivar. On average little pruning is necessary aside from training or shaping the tree in the habit it will naturally attain. Pruning of crape myrtles is best done in early spring before plants have broken dormancy. It is common to remove the lower limbs of all Crape myrtles. This attains two things. It reveals the beautiful sinuous, colorful trunks as well as improving air circulation which they all very much appreciate. Poorly ventilated crowded trees especially in too much shade can result in the disease powdery mildew. The cultivars that we grow are all naturally resistant to this disease but correct cultural conditions reduce this risk. Crape myrtles are heat loving trees and often they are one of the last trees to leaf out in spring. They require at least three days above 70ºF to wake and show bud break. This can be as early as April or as late as early May. Once warm weather arrives in earnest they will grow steadily. No tree looks more dormant than a Crape Myrtle- heat will arrive and so will leaves- be patient. Exfoliating showy bark is one of their most admirable traits. Each individual cultivar has its own distinct coloration. Crape Myrtle (fauriei) hybrids inherit that species amazing red/ orange/ muscular showy exfoliating bark- hence the amazing display of ‘Natchez’, ‘Osage’, ‘Pecos’. A feature as striking as flowers or fall color. Lagerstroemia on average begin losing their bark at three or so years after planting. Some cultivars earlier (‘Yuma’, ‘Hopi’, ‘Pecos’) when younger and straight L. indica varieties exhibit this trait a little later. Once a Crape Myrtle begins to exfoliate its bark (this happens in early summer) the tree has essentially achieved its full hardiness to cold which is 0ºF or quite a bit lower in established trees. The exposed new bark remains showy through the following spring. It should be noted that the species L. fauriei which was crossed with L. indica- the common species also have imparted resistance to disease. New L. indica selection on the market have also been selected for resistance. None of the varieties we grow susceptible to this disease and all have proven to be cold hardy in the worst winters. Crape myrtles require as high amount of heating calories during the summer not just for flowers and robust growth but to ensure that they are cold hardy for the following winter. Cool, shady, or cold gardens will not achieve this and even hardy trees can suffer cold damage at relatively mild temperatures. This is common in cooler rural areas where summer time lows rarely stay above 60ºF. In these locations careful attention must be paid to siting. Near a hot, south facing wall, or the reflective heat of asphalt paving. Anywhere you would be distinctly uncomfortable yourself on a hot day. They make excellent urban heat island occupants- absorbing the heat that is discharged at night from brick, glass, and concrete. This is a trait we should use to our advantage. 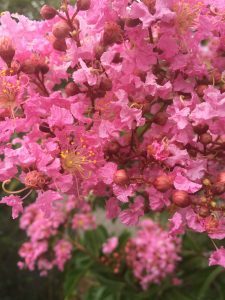 Crape myrtles as street trees: There has been great interest in the larger cultivars as street trees and in fact they have become popular in Portland and are being planted more and more. The largest varieties makes fantastic street trees and even the mid-sized cultivars (10-20′) eventually develop even greater stature than such commonly planted trees as Flowering Plums (Purple leaved plums) and that beautiful but ubiquitous tree the Paper Bark Maple (Acer griseum). Most street trees should be installed in a “standard” form. That is a single trunk where branching is limited to 5′-6′ above soil level. The city has yet to cotton to multi-trunked street trees but you can always ask. The two most popular cultivars as street trees as of now are ‘Natchez’ (white) and ‘Tuscarora’ (coral pink)- approximately 22′ + tall and eventually forming a spreading crowns respectively. In reality there are even better cultivars for this detail. 25’+ ‘Wichita’ would be a phenomenal street tree with an incredibly long season of bright lavender flower. The robust shade tree ‘Muskogee’ with lavender pink flowers for almost three months in summer is also an ideal choice. ‘Dynamite’ (to 20’+) (brilliant cherry red) has already been used as a street tree and should be more often. Other candidates that fit the size and desired scale are ‘Sarah’s Favorite’, (white), ‘Osage’ (pink) ‘Zuni’ (rosy purple) ‘Red Rocket’ (cherry red) ‘Pecos’- as a standard (pink) ‘Yuma’ (lavender) ‘Twilight’ (soft purple). All of these will eventually form respectable street trees. We will strive to grow more as standards to increase the home owners choice in this application. Make sure to water ALL street trees thoroughly and regularly through the first SEVERAL dry summers. This rapidly expands their root system and speeds growth dramatically. Build a basin around the base of the tree and mulch deeply with bark or compost to conserve soil moisture. Do NOT let grass or weeds grow up to the trunk of the tree (any tree that is getting established) these weeds will rob the surface of the soil of moisture and can result in drought stress and anemic growth for the tree. Water, water, water.